"friday-lunch-club": "Don't blame Hezbollah for the Marine barracks bombing. The United States is at fault, for becoming a combatant in Lebanon's civil war"
"Don't blame Hezbollah for the Marine barracks bombing. 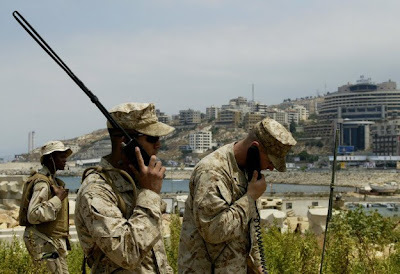 The United States is at fault, for becoming a combatant in Lebanon's civil war"
".... Last year, former Reagan-era National Security Advisor Robert McFarlane penned an especially ill-informed piece titled "From Beirut to 9/11." McFarlane blamed Hezbollah, though the Shiite resistance group did not yet really exist and nobody knows who actually committed the attack. ...McFarlane had made them so, and their blood is on his hands. The attitude among some at the National Security Council was that it was time to teach the Lebanese opposition forces -- read: Muslims -- a lesson. At the State Department's political and military affairs bureau, "we were shocked" by the shelling at Suq al-Gharb, one former senior member told me. "We were left speechless." They knew there would be retaliation for this American act of war. Geraghty was not the only military expert who has doubts about the U.S. role in Lebanon during the 1980s. Robert Baer was a CIA field agent covering Lebanon out of Damascus at the time of the bombing. "Don't forget the Lebanese Christian forces kidnapped the Iranian chargé d'affaires, a senior Iranian Revolutionary Guard Corps officer," he told me. "The Iranians held the U.S. responsible. As far as they were concerned, we opened the first shot in the war." w/ redirects from all the other variations such as suq, sug, etx. It is a common minconception that SUK was shelled by the USS New Jersey. Read the article to see what ships were involved.